The memoir begins as a four-year-old boy, named Richard Wright—the book’s author and narrator—and his unnamed brother sit quietly in their house in Mississippi. Their mother informs them that they must stay quiet, because their grandmother (their father’s mother) is dying. Richard is bored, and, not knowing what to do to occupy himself, he sets fire to a few straws pulled from a broom. He then places the flame near the room’s window curtains, not realizing it will cause them to blaze suddenly. Richard’s brother is startled by the fire, and Richard, frightened, runs out of the house and crawls into its foundation, hiding underneath its chimney. Richard, in his young life, often has a desire for action and for danger that can make his own life difficult, endanger his safety, and frustrate those around him. It is telling that Wright begins the narrative with a story of his own misbehavior—as the memoir progresses, Richard reforms, and begins to take into account others’ feelings, just as the world seems to be lining up against him. Finding one’s true self in a world of strict external authority will be one of the memoir’s primary struggles. Richard hears screams in the house, and continues to hide, hoping his family won’t realize he is responsible for setting the house ablaze. Richard then feels his father tugging at him, and his father pulls Richard from out of his hiding place. Richard’s mother and father seem relieved, at first, that Richard is OK, and tell Richard that their grandmother and all other family members survived the fire, although half the house has been destroyed. But days after the fire, realizing that Richard was at fault for the fire, his parents beat him so heavily that he nearly dies. Lying in bed after his beating (with a switch), he hallucinates in a fever for days, but ultimately survives. This scene foreshadows other instances in the memoir, in which Richard’s misbehavior causes the adults in his life not to reason with him, nor to explain exactly what he has done wrong. Rather, Richard is typically beaten for his indiscretions. Thus, he has a difficult time learning how to improve his behavior, how to act in the manner expected of him. His mother’s early violence, it seems, has a great deal to do with her own fears and anxieties as a parent. She perhaps worries that Richard will embark on a life of crime. Richard the narrator then recounts a number of different memories and sensory experiences from his childhood, in no particular order, including: the beauty of the natural world around Natchez, Mississippi (the town of his birth and earliest years), the plants and animals he sees, and the sky in the evening. Richard then recounts his first move, with his family, to Memphis, where his parents have gone, presumably, to find work. The family lives in a small, decrepit tenement in Memphis, and his father works as an overnight security guard at a drugstore. Because he works at night, Richard’s father is often tired and hard on the children, and he asks that they be quiet around the house when he sleeps during the day. Even when Richard’s father is “present,” providing money to the family and living under the same roof, he is “absent,” in that he works during the night and sleeps during the day. Richard’s father remains an enigma to him throughout the memoir—there is no moment of reconciliation between these two men. And, indeed, Richard’s relationships with ensuing “father figures,” including Uncle Tom and Grandpa, tend mostly to revolve around punishment for Richard’s perceived misbehavior. Richard recounts a story, in which he and his brother, playing with a cat, wake his father. Richard’s father then tells Richard to kill to cat, or “do anything” to keep the cat from making noise. Although Richard and his brother know that his father does not mean actually to murder the cat, Richard pretends that he has understood his father’s command literally, and kills the cat by hanging it in a tree. A gruesome scene, and perhaps the low point of Richard’s childhood misbehavior. From this moment onward, Richard appears to understand, if imperfectly, that his actions have consequences and that killing the cat does not so much harm the father as it does hurt another living thing. Richard’s brother is horrified by Richard’s actions, and Richard’s mother chastises him, saying that it was a sin to kill the cat, and that Richard knew his father was not being serious with his “command” to do so. Richard’s father realizes he cannot beat Richard for following his order—Richard has therefore gotten the upper hand on his father on this occasion—but Richard’s mother punishes Richard by forcing him to untie the cat, bury it, and say a few words at its “funeral.” This causes Richard to feel terrible for his act of brutality, and he states that, after this episode, he never wanted to see a kitten again. Here, Richard’s mother’s punishment might appear brutal, but it causes Richard to confront his murder of the cat, and the ease with which he carried out the crime. The hanging of the cat (though not acknowledged by Richard in this way), also foreshadows the threat of death by lynching at the hands of white men that seems to follow Richard and all other black people in the South. Richard reports that he begins feeling hungry, that there is no food in the house. At first, when he tells this to his mother, she laughs and says he should catch a “kungry” if he’s hungry—an imaginary beast that hungry boys can eat. But, after Richard complains more about more about his hunger pains, his mother tells him that his father has left the family, and that she will have to get a job to put food on the table. Richard and his brother ask, periodically, why their father is no longer living with them, but their mother refuses to explain why he’s gone. Although she becomes a more sympathetic character later in the narrative—especially after Granny is revealed to be one of the memoir’s antagonists—Richard’s mother is a serious woman, who is nearly devastated as a young woman, when her husband leaves the family. Hunger, meanwhile, is a constant in Richard's life—a product of both the poverty in which nearly all blacks in the South live but also his own father's abandonment. His mother begins sending Richard out to buy groceries, and a pack of young boys in the neighborhood continually beat him up, stealing his food basket and money. Richard complains to his mother, who tells him he won’t be allowed back in the house if he doesn’t purchase the food. She gives him more money and a stick to beat off the bullies, which Richard eventually uses on them, scaring them away. At this point, Richard reports that he feels more comfortable walking the streets of Memphis, though he is only a young boy. An example of Richard’s mother’s “tough love.” Richard, for his part, fights the boys even though he is deathly afraid of them, and he obeys his mother even though he understands that she is being particularly strict. Richard encounters a great many difficulties between the ages of four and seventeen, and his self-reliance and ability to fight back against his antagonists is an enormous boon for him. Richard’s mother begins working as a cook for a white family, and Richard—who is forced to watch the white family eat sumptuous meals, prepared by his mother—walks hungrily around town while his mother is on the job. One day, he wanders near a bar filled with drunks, and they invite him inside, saying that if he is going to “peep around” there in the daytime, he might as well have a drink. The drunks tell Richard inappropriate phrases to repeat to one another and to women in the bar, in exchange for sips of alcohol, and Richard finds himself more or less constantly drunk for days at a time, though he is only six years old. His mother beats him with a switch to correct his behavior, and finally, after his mother hires a babysitter to look after Richard and his brother, the “taste of alcohol” leaves Richard, and he does not drink again until he is much older. Although Richard seems quite innocent in some ways—not knowing, for example, that lighting the curtains on fire will nearly destroy the entire house—he is, in other ways, a hardened “adult” in the body of a child. Here, Richard notes that he was a “drunk” before he was anything else—a student, a lover of literature, an émigré to the North. Throughout the memoir, there are moments when it is clear that Richard’s life could have taken one of two paths. Here, Richard is thankful that he did not succumb to a lifetime of alcohol abuse—that his “taste” for alcohol was nothing more than a child’s passing interest. Meanwhile, all the men who fed him alcohol for fun clearly took another path, and there is a sense that the black men in the bar seek their escape in alcohol and the frivolous, destructive behavior it encourages. One day, Richard’s mother orders coal for the house and tells Richard to wait for the delivery man to bring it. The man realizes that Richard is poor, hungry, and uneducated—that Richard does not even know how to count—and so the coal-man teachers Richard how to recite the numbers. Richard also begins picking his way through children’s books left on the street by schoolchildren. Because Richard has no father-figure in the home, it is only by accident that men in his life teach him anything. Of course, his mother, too, could have taught Richard the basics of reading and writing, but Richard’s mother is working much of the day, in order to feed her two children. At this age—around six—Richard also learns of the hatred between “white” and “black” people from his mother. Richard is at first confused, since his Granny (his mother’s mother) has very light skin but is considered black. But his mother begins explaining to him that whites and blacks in Memphis are separate groups that do not mix, and that whites occasionally become violently angry at blacks. Richard “wonders to himself” what white people are “really like” when he sees them on the street. Richard’s understanding of “whiteness” and “blackness” is of central interest in the memoir. At first, Richard does not understand that these two categories—the former “good,” the latter associated with “being bad”—have much to do with the color of one’s skin. Richard, instead, thinks most people’s skin exists on a gradient of lighter and darker shades, without falling into obvious racial categories. Richard also here thinks of White people as people whom he could get to know. Richard’s mother scrapes together money to send Richard to school—she must buy him a uniform so he can be admitted—and on the first day, Richard learns many slang words, mostly dirty, from his fellow students. On his way back from school, Richard soaps these words onto the windows of neighborhood houses, but when his mother finds out, she sends Richard back to erase his work. Richard remarks that he “kept those words to himself” from this point on. Interestingly, this is Richard’s first experience of “writing” in the memoir. The words are those he has heard in school—words that he knows are forbidden in his home, but words, too, that have a powerful and immediate effect on the neighbors. Richard gives up swearing in this way, but he does not give up the act of writing—it is one of the primary activities of his life. Richard’s mother becomes more observantly religious after his father leaves, and she invites the preacher from the local church over for dinner. But Richard cries out when the preacher takes nearly all the chicken from the dinner table, and Richard begins to sense, even at a young age, that preachers and religious men can have the same failings as non-religious people. Most of the preachers in the memoir are concerned, primarily, with a theatrical presentation of scripture, and with ensuring that the church is continually growing and adding new members. Richard does not find any preachers (though surely there were some) who talk to him, genuinely, about their experiences of faith. Richard goes to court, with his brother and mother, as his mother attempts to argue before a judge that Richard’s father should pay child support. But the father says he is doing all he can, that he has no more money, and the judge accepts his argument. Richard and the family continue living in near-total poverty, and they are hungry much of the time after his mother becomes sick with an undisclosed illness, and can no longer work. She places Richard and his brother in a local orphanage, in the care of Miss Simon, because she cannot afford to feed, clothe, and house the boys. Richard’s father’s self-defense would be laughable, if it weren’t for the horrific circumstances Richard and his brother face. Both children barely have enough to eat, and Richard’s mother is so concerned with their wellbeing that she is nearly crippled by her anxiety. Yet Richard’s father lies to the judge, says he is doing all he can, and continues to provide no money at all in child support. At the orphanage, Richard continues to be hungry—they are mostly fed a kind of gruel—and the boys spend their days with the other children, pulling grass out of the orphanage lawn, because the facility is too poor to afford lawn mowers. Miss Simon takes a liking to Richard and asks if he would like to be adopted by her, but Richard says that, at this point, he has “learned to distrust everyone,” and rebuffs Miss Simon’s advances. Miss Simon wishes for Richard to be her “secretary,” and she asks him to blot letters for her, but he freezes and cannot complete the task. Miss Simon asks what’s wrong with Richard, and he leaves the room. Miss Simon’s motivations in this section aren’t exactly clear, although she appears simply to like Richard and to want to help him in any way possible. Richard’s family has already been torn apart once, however, when his father leaves, and when his brother is placed with Aunt Maggie in Detroit, it will be torn apart again. Perhaps Richard simply has no room in his life for another maternal authority figure—one who might, when things become difficult, choose also to “abandon” him. Later that day, Richard decides to leave the orphanage, and he runs away into the streets of Memphis, where he is soon picked up by a white police officer. The officer takes Richard back to the orphanage, where he is lashed by Miss Simon. When his mother next visits, she tells Richard that he must remain in the orphanage and be a “good boy,” otherwise he will only cause her pain and suffering. Richard’s early run-ins with the law have little to do with his actual criminal endeavors—his fights, his drinking—and much more to do with the racial composition of the local police force (mostly white). Here, Richard is spotted on the street and immediately identified as a runaway. His mother agrees to take Richard out of the orphanage if he will go to his father and ask for money to feed the family. Richard, understanding that he must make difficult choices like this if he wants to survive, agrees to do so, and goes with his mother to his father’s new house, where he lives with a “strange woman,” his girlfriend. His father tells Richard that Richard can live with him—he would then have “all the food he wants”—but Richard tells his father he hates him and the strange woman. His father offers a nickel to feed the family, but his mother tells him not to take it, out of principle, and Richard refuses. Wright then closes the chapter with a vision of his father 25 years later, when he next sees him. Richard has returned on a visit from the north, and finds that his father is now a sharecropper, or farm-servant, on a plantation outside Memphis. His father has been hobbled by years of hard work in the fields, and though Richard understands that they are related, he feels he has nothing in common with this man. Richard says that his father “tried to make it in the city, but failed,” and returned to the countryside, where he, a black peasant, felt more comfortable, and where the work required only physical strength and constant toil. An emotionally devastating passage, one to which Richard does not return in the memoir. But the specter of Richard’s father haunts the story, and Richard does everything he can to leave the South, and to establish himself in the North, so that he can avoid his father’s fate. Richard also places a great deal of emphasis on his education—particularly on literacy—since he believes that a good deal of his father’s suffering, and the suffering of many African Americans, stems from a lack education. Schlegel, Chris. 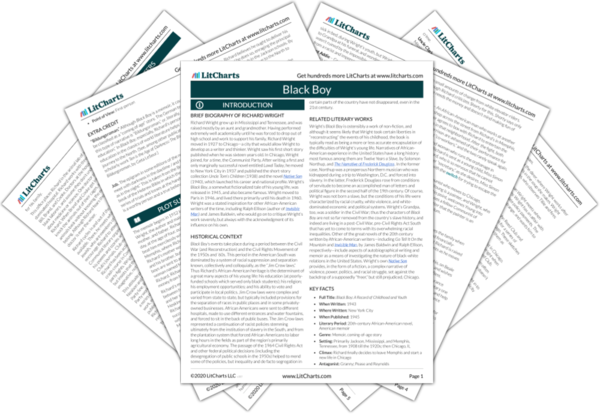 "Black Boy Chapter 1." LitCharts. LitCharts LLC, 18 Jun 2014. Web. 18 Apr 2019. Schlegel, Chris. "Black Boy Chapter 1." LitCharts LLC, June 18, 2014. 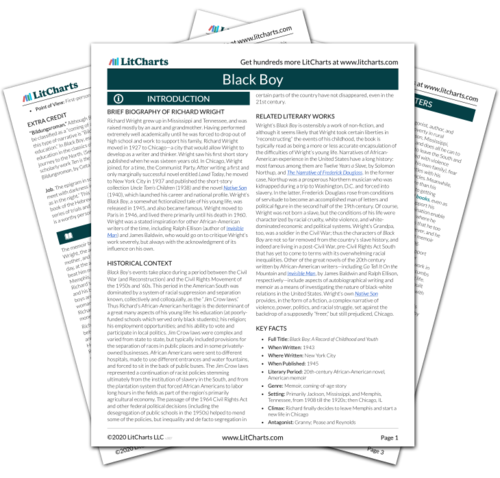 Retrieved April 18, 2019. https://www.litcharts.com/lit/black-boy/chapter-1.